Life is better in my 40s than it was in my 30s. My 30s were far better than my 20s. And my childhood-to-teen years were pure trauma and terror. But there are aspects of adulthood that are more difficult than in my youth. Particularly fitness and health. I take relatively good care of myself but I’ve put on weight over the last ten years or so that I just can’t shed. And I’ve tried plenty of methods. I even bought a book called Always Hungry that I still haven’t read. I considered taking another crack at the Whole30 for the month of May, just to curb some bad habits. Then I went down the rabbit hole, reading about the combo of carb cycling and High Intensity Interval Training. Considered going that route and then I read this rebuttal that appeared in my inbox, along with this piece about An Unexpectedly Awesome Side Effect of Not Drinking. But I came to the same realization as before. Whatever I do, it needs to be sustainable. I’ll probably stick with what I’ve already been doing. Nutritious meal prep on the weekends to get me through the week, daily long walks, drinking less and less often on week nights and working out at home (more regularly). At this point it’s going to be about maintaining rather than transforming. I’ll have to make my peace with that. My son is attending prom for the first time this Saturday. Seeing prom tweets and prom posts on reddit are getting me in the feels more than usual. Like this one. This modern life is so weird. I’ve never been into sports much but I was a child of the 70s, and was always fascinated by Kareem Abdul-Jabbar. Especially after seeing his fight scene with Bruce Lee. But now he’s doing a different kind of dancing, on Dancing With the Stars. What other weirdness do I have to look forward to seeing as I age? Kevin Morby Explains His New Album, ‘City Music’ Track By Track. Mysterious wooden statue found in peat bog is ‘twice as old as Stonehenge’ - Scientists now think the Shigir Idol, found in Siberia more than a century ago, is the world’s oldest wooden sculpture. Pretty neat. Episodes 1 and 2 of In the Dark Season two are out now. How can someone be tried six times for the same crime? Why double jeopardy doesn’t apply in the Curtis Flowers case. Yesterday I went for my lunch walk, as I do every day. 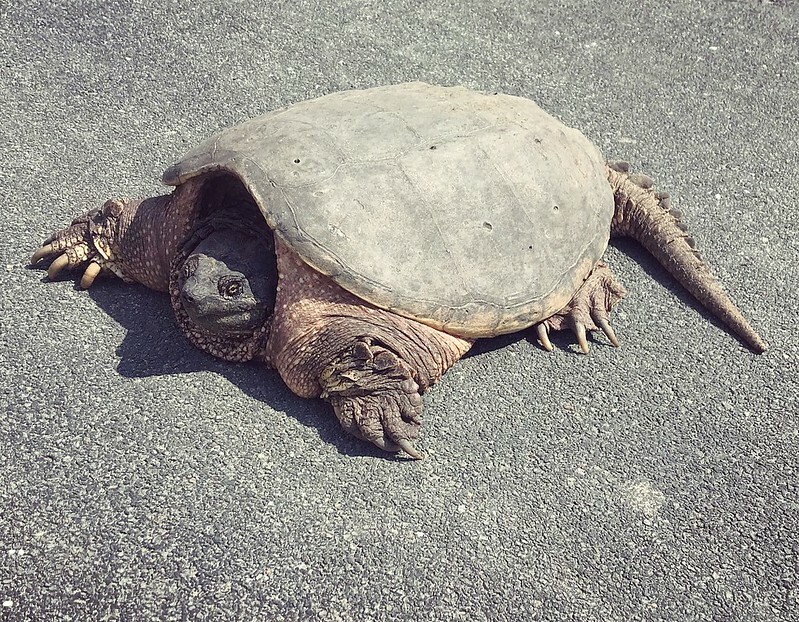 But this time I encountered an ENORMOUS snapping turtle, sunning itself in the middle of a busy street outside of my office building. A crowd gathered and eventually I moved on. But some brave someone either moved the prehistoric looking beastie or it moved itself. On my way back to work I spotted it safely on the other side of a fence in the woods, not far from a creek. I hope she’s all right (I’ve decided to call her Agnes). Today’s lunch walk provided a different, less surprising surprise. The trees have finally all started budding, seemingly overnight. My seasonal allergies make me physically uncomfortable but I do love when everything turns lush and green. This was written by Sharyn. Posted on Wednesday, May 2, 2018, at 1:50 pm. Filed under geekery, general distractions, general web junk, hodge-podge. Bookmark the permalink. Follow comments here with the RSS feed. Trackbacks are closed, but you can post a comment.